Trustee Raymond Toto, former President Dr. Richard DeCosmo, Chester County Commissioner Terence Farrell, PA State Representative Becky Corbin, President Dr. L. Joy Gates Black, Trustee Robert McCauley, Trustees Vice-Chair Kevin Scott, Provost Dr. Monica Parrish Trent, Trustee Dr. Corrinne Caldwell and Trustee James Gaffney at the ribbon-cutting ceremony. 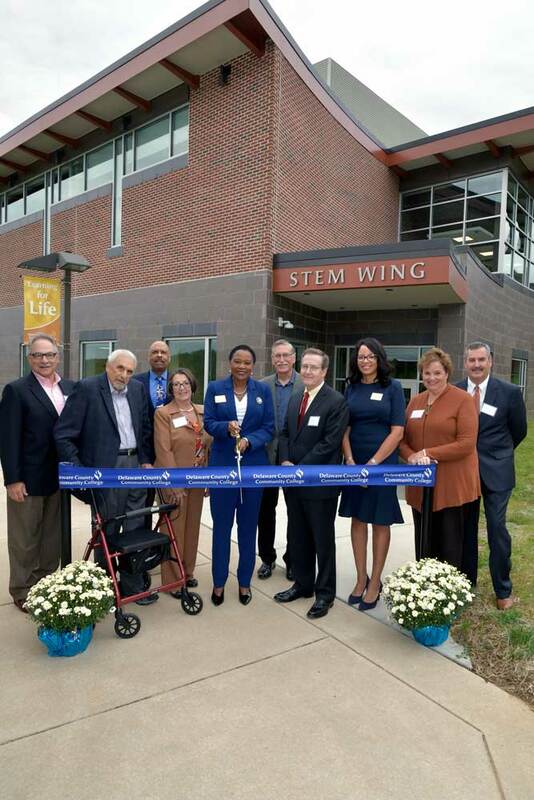 Under an overcast sky, about 80 people gathered this morning to celebrate the official opening of the new Science Technology Engineering and Mathematics (STEM) Wing at Delaware County Community College’s Downingtown Campus (100 Bond Drive, Downingtown, PA 19335). “By offering affordable, quality STEM education closer to home, more people will be encouraged to pursue these professional paths, which are essential to keeping Pennsylvania and the country competitive in the world,” said Pennsylvania State Representative Becky Corbin, one of the speakers at the ribbon-cutting ceremony. Representative Corbin represents the 155th District in which the Downingtown Campus is located. The 16,000-square-foot STEM Wing addition to the existing Downingtown Campus includes state-of-the-art biology, chemistry, and earth and space science laboratories, as well as eight new classrooms, and newly renovated computer and physics labs located in the existing 46,000-square-foot main building. “Through this $9.6 million investment Delaware County Community College is demonstrating its commitment to Chester County,” said President Dr. L. Joy Gates Black. 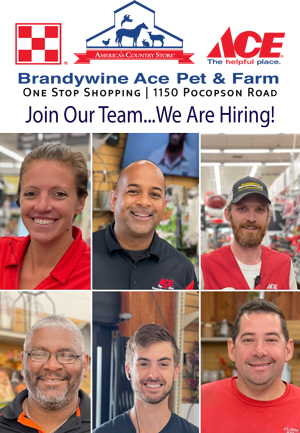 Board of Trustees Vice-Chairman Kevin Scott pointed out that of the College’s eight locations, five are in Chester County, including the College’s Downingtown and Brandywine Campuses in Downingtown, the Exton Center, the Phoenixville Campus and the Pennocks Bridge Campus in West Grove. Representative Corbin, who majored in chemistry in college and was a chemist before becoming a state representative, said today is a much more opportune time for women to pursue STEM careers than when she studied to be a chemist in the 1970s. “Science and math were thought of as male subjects. I really did not have many female role models to look to for inspiration,” she said, adding that, today, women are much more encouraged to pursue STEM careers. “Congratulations to the College on this monumental step in encouraging STEM education for our young people,” she said. If the UCFSD board members had half a brain (& lose their egos) they would become a sponsoring SD of DCCC A much better investment than the MILLIONS they plan to spend on athletic fields!